The hotel is named after the love story of Narvar prince Dhola and Poogal princess Maru, married in their childhood. The love tale of Dhola Maru is deeply rooted in folklore and oral traditions. Situated in the heart of city, ideal for holiday tours and to organize functions/marriages. The building is modern with spacious air condition/non ac rooms, restaurant serving variety of cuisine and well stocked bar offering drinks including scotch, wine and beer.Hotel provide traveler an experience of Rajasthan with safety and security. 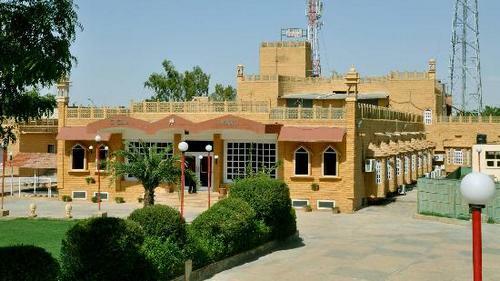 Airport: Direct flights from Delhi or Mumbai to Jodhpur which is the nearest airport around 200 km from Bikaner. Bus Stand: 1299 km from Mumbai, 754 km from Ahmedabad, 321 km from Jaipur, and 470 km from New Delhi. Railway Station: Convenient overnight trains from New Delhi, Mumbai, Ahmedabad & Jaipur. Serving Indian, Rajasthani liquor & wine.